Prom Night is the most awaited date in a teen-ager's calendar and sad to say yours truly, had never experienced such a momentous event in my high school life but my daughter did. 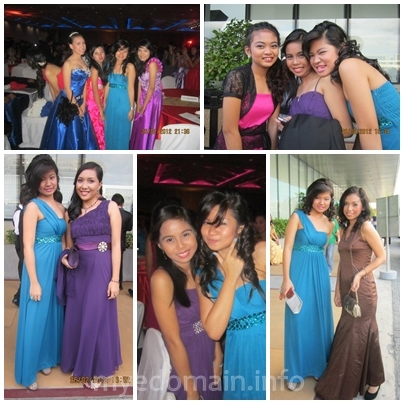 February 26 of last year, Lizette had their Senior Prom Night at the SMX Convention Center in Pasay City. She wore a one shoulder strap jade-green colored gown beaded on the waist. Simple and inexpensive but the dress perfectly fitted an equally simple yet charming young lady. Her anticipation might not that high but I was sure then that she looked forward to this night because it's her first time to attend a formal event like this and she would be partying with her closest friends and classmates. This was indeed a night to remember. I felt a mixture of awe and excitement when I saw my one and only princess wearing this gown. I was reminiscent as well because, it's like only yesterday when I brought her to the world and now she's a grown up young lady with a promising future ahead of her. Come November, she will be celebrating her eighteenth birthday. The truth is, we have no plans for a debut party yet. I just hope my husband and I will able to make her one simple wish come true instead of any grand celebration. I just want her to enjoy life while she's young but her studies should always be her top priority other than any thing. Nice photos, you look great on your prom and it seems you have lots of fun. Yeah, my nephews and nieces are also now in their prom season. How fast they grow. Your little princess is a real grown-up now. Congrats to the doting mom :) I just hope she enjoyed her prom night. She had an undeniable beauty. 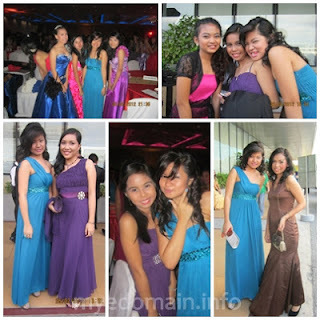 .one of the most anticipating moment being in high school or college is the PROM. .and it excites everyone else. I hope she had a great time on her prom night. It's one of the highlights of being a teen. She looks so pretty in that blue dress. And the styling and make up is just perfect. nice photos. All I have to do now is just to savor the memories of those prom nights I have experienced. Ang ganda naman ng anak mo. Like mother like daughter! :) Prom is definitely one of the most memorable nights for a teenager! Beautiful! I have no actual experience about PROM because I studied in an all-girls school in HS. Still, I don;t feel bereft for not experiencing such a life changing event in a teenager's life. She is a pretty girl and gorgeous on her gown. She made a memorable prom night. I never experienced this back in high school. my prom really sucked! it was horrible and very messy.. maybe because my whole face was covered with pimples back the and I just don't know fashion yet.. haha..
Prom is very memorable talaga sa High School, your daughter looks dashing!